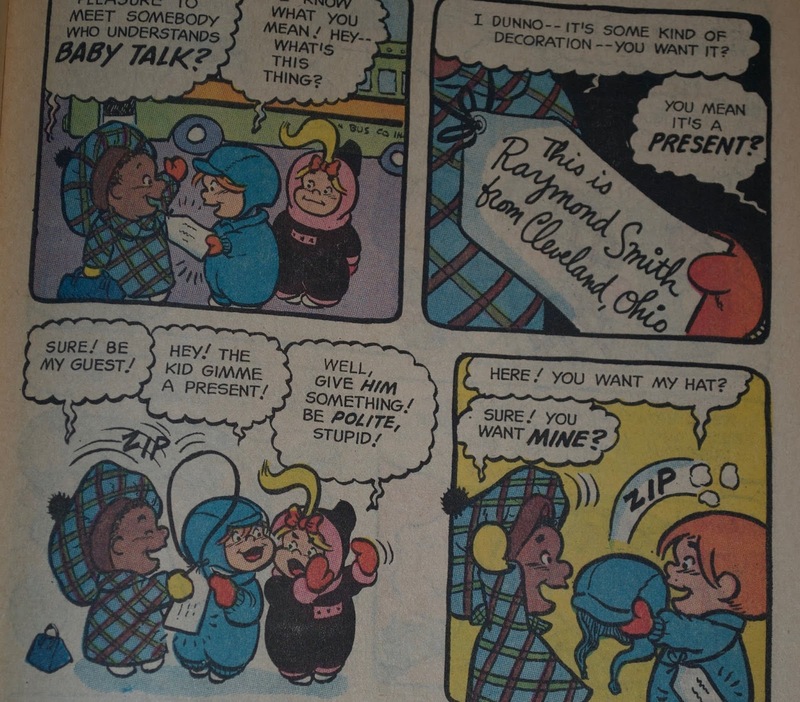 Raymond is the final of only 3 black character to debut in American comics in 1970. Although cover-dated March, 1971, Sugar and Spike 94 was actually released in December 1970. The dating convention of periodical comic books for newsstands are a weird and arcane thing, but trust me on this one. 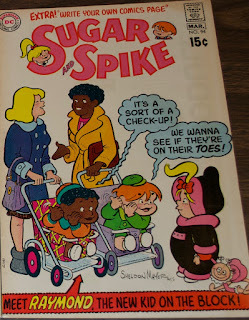 Sugar and Spike was a delightful, funny, and charming comic created by Sheldon Mayer at DC for a little short of 20 years. It followed the adventures of 2 babies, Sugar and her neighbor Spike. The children communicated in baby talk, a language universal to all infants in all cultures regardless of what the regional adult language is. You could be a baby from any country or even any planet, and still speak it. Baby lobsters know it. Santa Claus knows it, and so do men old enough to experience a second childhood. Adults only hear gibberish "GLX! SPTZL! GLAH!" and never believe the duo can actually communicate with one another. Many of the pair's adventures broke down into 3 types of plots. 1) The kids get in trouble due to a misunderstanding of how the grown-up world worked. Misunderstandings about the telephone, Christmas presents, photographs, hoses, and TV are all fodder for these tales. 2) They want something, and the means they use to get it results in them siting the corner at story's end. This includes cookies, ice cream, gold fish, broken dishes, etc. 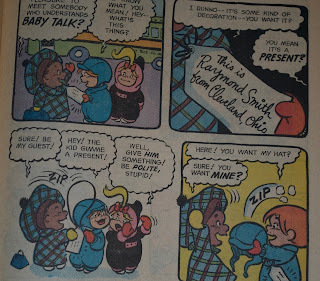 3) The kids have fun adventures with other characters that also know baby talk. This is often how new characters debut. Alien visitor Space Sprout, kid genius Bernie the Brain, bully Little Arthur, and even Santa fall in this category. Raymond was a part of that tradition. The Original New Kid On The Block! As the cover suggests, Spike and Raymond meet and decide to swap clothes to fool their parents. Mayer's premise of "babies don't see race" was a smart approach to take. It allowed the children and their parents to all act with dignity. The humor was more about their antics, and taught a lesson without being preachy. Mayer was an expert cartoonist, and found just the right tone to deliver the idea without ever overtly discussing race. Raymond, unfortunately, didn't make it back for any additional playdates. Sugar and Spike ended just a few months later with issue 98 due to health issues. Typically, once a character showed up in this book they ended up in rotation. Bernie the Brain, Little Arther, Uncle Charlie, and even their lobster friend were semi-regulars at different points in the comic's history. I feel strongly that, if not for declining eyesight, Mayer would have brought Raymond back at least once. DC's arrangement with Mayer was unusual for the industry I that his rights as the creator were respected. The agreement prevented other cartoonists from reviving the book. As a result, Raymond was never seen again.